Seth and Skye standing under their new window. 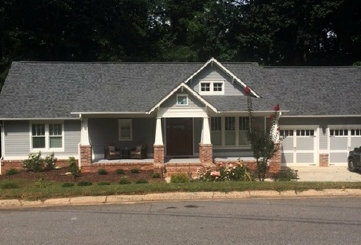 Above is the Greg's 1950's Ranch style house dramatically renovated into a Craftsman style home. What an amazing transformation! 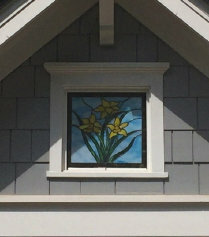 In this process, he created a dormer window over his front porch that he envisioned with stained glass. It opened into the porch with the porch light behind it, so it would be lit at night. 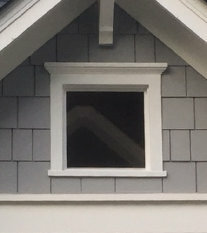 Seth and Skye's Window measures about 18" x 17", contains 75 pieces of glass and was completed in July, 2017. I was proud to play a very small part in Greg's massive remodeling project. 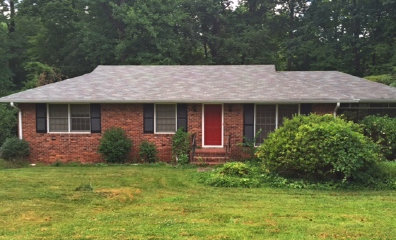 He and his family can now have daffodils year round in Smyrna, Georgia. 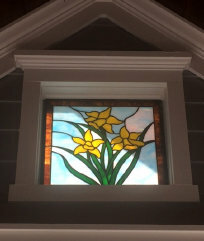 Greg called me about building a small stained glass window for his home in Smyrna, Ga. 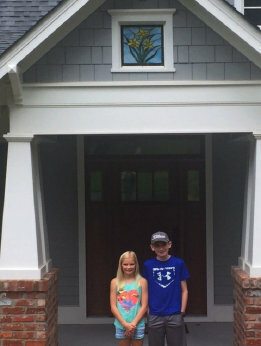 He explained he was renovating his 1950's brick ranch house into a Craftsman style home and had created the perfect opening over his front entryway for stained glass. 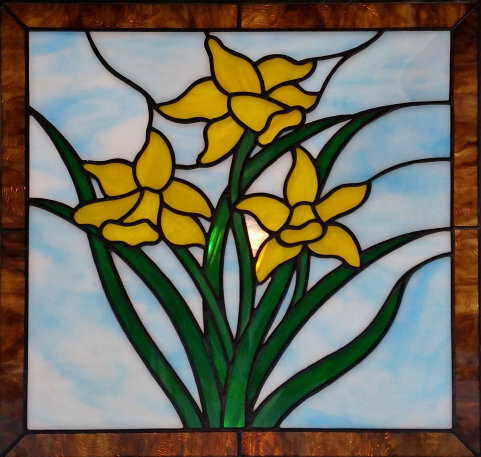 He liked a daffodil design I built years ago and explained there were a couple of reasons he wanted a daffodil design window. The city of Smyrna is known as the "Jonquil City" and while there is a difference between jonquils and daffodils (jonquils are smaller and have more clusters) it is hard to tell a difference visually. Many southerners just call them both daffodils. There is also a late winter family tradition in Greg's household. After the first few mild days in Februrary, Greg, Shannon and their kids, Seth and Skye, are always on the lookout for the first daffodil of the year. When spotted and the location is shared with eveyone, the Wordsworth poem, 'I Wandered Lonely as a Cloud', is read out loud.